Are you prepared to engineer a brave new tomorrow? The ongoing viral for The Amazing Spider-Man picked up in a big way today, with some creepy local pick-ups in 12 different cities across the country. While the focus for the last few months has been Spidey himself and the Mark of the Spider-Man, earlier this week the new Oscorp Industries website was discovered, launching the next phase of the viral which involves The Lizard this time. A twitter called @ScaleSeeker run by another student at Peter Parker's high school tweeted out locations all day for pick ups including creepy Lizard evidence - like a shredded Oscorp lab coat. The days events began with tweets from the "ScaleSeeker" with locations in Atlanta, Tampa and NYC. "Get ready. In just a few minutes we will be starting the #LizardTrail!" He calls out for help "We're going to need samples from all 12 boroughs in order to categorize this fascinating specimen." Indeed, a specimen named Dr. Curt Connors, perhaps? 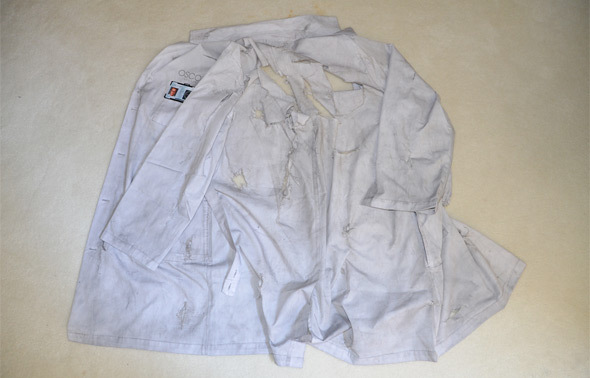 The first to make it to the tweet GPS coordinates would pick up an Oscorp Industries package that included Dr. Connors' ID badge, a scale specimen already encased and the coolest piece of all - a shredded Oscorp lab coat (photo here). I think we're all putting together the pieces and figuring out the story, how it ties into the latest trailer. This was an incredibly cool batch of viral swag. Here's a look at some more photos from the viral of what the lucky few were able to pick-up. You can find many more tweets and photos from the @ScaleSeeker twitter or thanks to MovieViral. More updates below! 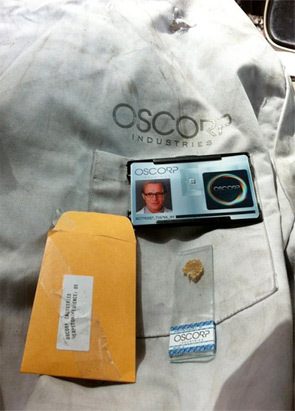 After all 12 "specimens" were picked up in all 12 cities (Los Angeles, New York, Atlanta, Chicago, Salt Lake City, Las Vegas, Phoenix, Seattle, Austin, Tampa, Mineeapolis, New Orleans) it unlocked a code that would lead to a video on the Oscorp Industries site featuring Rhys Ifans as Dr. Curt Connors talking about herpetology, the study of reptiles, and their internship program. The plot thickens. There's definitely more to this, but it was a pretty cool update. The Oscorp website is the HQ for this latest phase of the viral, as other twitter fans have already discovered more hidden clues. The message with the video also states: "Step into the virtual lab this Monday, May 14th, and help us chart a path to unprecedented innovation." It sounds like Oscorp is launching an internship program? And they'll be taking applications next week? "INTERN INITIATIVE: 5.14.12 - Are you prepared to engineer a brave new tomorrow?" 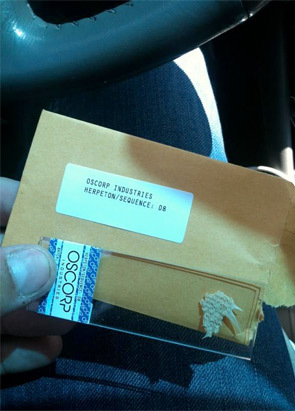 Anyone remember getting those Oscorp Industries ID badges at Comic-Con last year? I haven't seen them mention anywhere since, but it is peculiar that Dr. Connors' ID badge that was picked up in this viral today is the same badge. Or at least a connection, and a hint that Oscorp will definitely play a bigger role as things continue. For now, this is the latest, and I suggest exploring the new /animaldynamicslab/ viral site and sharing if you can. I always love seeing virals drop off awesome swag, or hell perhaps even real props, from the movie for fans. The stuff they put out today was just amazing, and I wish I could've nabbed that lab coat and sample, but there was only one in Los Angeles. Damn! In the meantime, we'll keep you in the loop on Marc Webb's The Amazing Spider-Man, but also follow @ScaleSeeker and keep an eye on the Oscorp site. Until next time! Viral marketing is so uninteresting. Well, maybe reading it afterwards, but if you followed it as it happened today and ran around cities looking for this swag, it would be much more exciting. That's the coolest part of virals, that interaction. So is making uninteresting comments. I thought like that too until I participated in one. It adds a new layer of complexity to a film and allows you to drag out the experience as long as possible. When I walked into Tron: Legacy wearing my laminated badge I felt like a part of a club and now whenever I look at that keepsake it reminds me of that film and the excitement I felt walking up to the theater. I really want an ID badge like the TRON viral. I like those viral videos it makes me feel that I'm apart of that world.